Iranians, both moderates and mullahs, have reason to fear Mahmoud Ahmadinejad, writes William O. Beeman. Those who hate the clerical establishment in Iran and wish it would disappear should be delighted with President Mahmoud Ahmadinejad. Too late, the clerics have discovered that they have a tiger by the tail. Mr Ahmadinejad may be dedicated to their eradication. The bad news for the West is that Mr Ahmadinejad's assault on the Iranian Government is an assault from the right. He has rejected both the reformist politics of President Khatami, and the establishment Islamic leadership of Ayatollah Ali Khamenei. 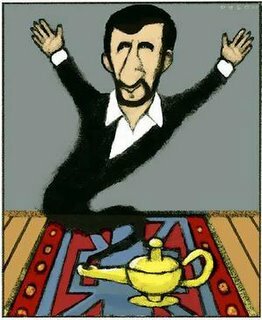 Mr Ahmadinejad's election was the crowning success of Iran's own neoconservative movement, the Abadgaran-e Iran-e Islami (Developers of an Islamic Iran), or the Abadgaran for short. The Abadgaran have been described as second-generation revolutionaries. They are people who participated in the Revolution of 1978-79, who have become disillusioned with the ruling clerical establishment in Tehran, and have been dedicated to re-establishing the ideals of the original revolution. In the past 26 years they have grown up and established themselves in positions of power everywhere. They were the dominant political group in almost every major municipality in Iran before the election. Operating from the mosques, just as in the original revolution, they flew under the media radar, thus creating an illusion of surprise when Mr Ahmadinejad roared to victory on a populist platform promising economic reform and financial equality for Iran's poor. Mr Ahmadinejad appeared benign enough in June. A pious, ruthlessly honest and modest civil engineer, he had done an excellent job as Tehran's mayor. However, he immediately sent shockwaves through the establishment by proposing ill-suited ideologues as ministers in his new Government, by his badly received appearance at the United Nations, by his fiery condemnation of the "Zionist regime" in Israel - an action that attracted international condemnation - and finally, by his recall of 40 moderate Iranian ambassadors. His actions have caused consternation in segments of the Iranian public as well. On November 3, his Government introduced a scheme to provide shares of national industries to Iran's poor, allowing them 20 years to repay the cost of the equities. Rumours have flown that the next target is Iran's private industrial holdings. There is no opposition between Islam and capitalism, and Iran is ruthlessly capitalist. Iranian owners of industry were not going to wait to find out whether the rumours were true. Reportedly more than $US200 billion ($A270 billion) in investment income has fled Iran for Dubai, where about 2000 new businesses have been established in the past four months. The capital flight was accelerated by Mr Ahmadinejad's remarks against Israel, after which the Tehran stock exchange plummeted to its lowest point in two years. The irony for the establishment clerics was that no matter who won the election they were going to be in trouble, since all candidates but the one they had handpicked, former radio and television head Ali Larijani, opposed one or another aspect of their governance. Mr Larijani has now been reappointed as head of Iran's Supreme National Security Council and chief negotiator for Iran's nuclear energy initiative with European powers and the United Nations. His reassignment is indicative of the current state of affairs, as cracks begin to show in Iran's Islamic leadership. Confusion reigns as the establishment clerics try to contain Mr Ahmadinejad while presenting a smooth face to the world. The Iranian Foreign Ministry as well as Ayatollah Khamenei tried to soften Mr Ahmadinejad's anti-Israel remarks and assure the world that Iran intended no violence against any other nation. Presidential runner-up Ali Akbar Hashemi Rafsanjani, who went back to his old job as head of Iran's intra-governmental Expediency Council, has quietly moved to relieve Mr Ahmadinejad of his foreign policy and diplomatic duties. However, Hashemi Rafsanjani, and other clerics rumoured to be rich and corrupt, are anathema to the Abadgaran that support Mr Ahmadinejad. What is at stake is nothing less than the Islamic Republic itself if an internal feud breaks out. The velayat-e-faqih - or rule of the chief jurisprudent - on which Iranian government is based, and through which Ayatollah Khamenei holds his authority, was established after the revolution. No senior Shiite cleric in the world agrees with it any longer. If Mr Ahmadinejad is placed under too much pressure by the likes of Ayatollah Khamenei or Mr Rafsanjani, he may well have the political clout through his followers to force a reconsideration of the entire basis of Iranian government. There are many Iranians who would welcome such a move. The Iranian Parliament is eager to overhaul the Iranian constitution, which gives control of government to the clerics, but they have been prevented from doing so by the powerful, indirectly chosen Council of Guardians. The result of constitutional revision might still be an Islamic Republic not to the taste of the Bush Administration, but it would end clerical rule in Iran. One thing is certain: change is inevitable in Iran. Moreover, President Ahmadinejad and the Abadgaran, if they achieve their aims, should not rest on their laurels. The whirlwind he is setting in motion today is nothing compared to the tornado that will sweep into power in the next decade - the youth of Iran, who in five years will be the majority of voters. None of them participated in the original Revolution, brought the Ayatollah Khomeini to power, or ratified the Islamic Republic. William O. Beeman is professor of Middle East anthropology at Brown University in the US. He has conducted research in Iran for more than 30 years and is the author of The "Great Satan" vs. the "Mad Mullahs": How the United States and Iran Demonize Each Other. Like a bad penny, Ahmad Chalabi is again turning up, and miraculously the United States is set to back him as prime minister of Iraq in the upcoming Dec. 15 elections for the first "real" government in the country. His visit to Washington is scheduled for Nov. 7-12. Never mind that Chalabi was convicted of embezzlement, that he was accused of misleading the United States on the issue of weapons of mass destruction prior to the American invasion of Iraq in 2003, or that he guaranteed a loving welcome for U.S. troops from Iraqis, who he claimed would be grateful and ecstatic to be rid of Saddam Hussein. Never mind either that he was receiving $300,000 a month for some time to provide unspecified services for Viceroy Paul Bremer's interim government, or that he led the de-Baathification effort to purge Iraq of his political enemies. Forget all that! Chalabi is the probable winner in the upcoming elections. That is all Washington needs to know, and if he was reliably in bed with the U.S. government once, the neocons know that he is likely to jump in once again if he comes to power, bringing with him control of Iraq's petroleum and sanctioning a permanent U.S. military presence. Chalabi's family has a pedigree that goes back to the founding of the Iraqi state by the British in the 1920s. The Chalabis were the only Shia family to be represented in government cabinets during the Iraqi monarchy, which ended in the 1958 revolution that ushered in the age of military dictatorship culminating with Saddam Hussein. He believes that he has a presumptive right to rule, and is willing to stop at nothing to achieve his ambitions. Since he was "ousted" from power by the Bremer administration, Chalabi re-invented himself as an anti-American Shiite adherent. He visited Grand Ayatollah Ali al-Sistani in Najaf, and got himself on the Shiite religious party list to participate in the interim government. (Iraqis voted not for individuals, but for political parties.) When his party list captured a plurality in the election, he worked his way into being deputy minister of oil -- a powerful position that allowed him to secure a substantial income for himself running an oil-field security operation. Now that the Iraqi constitution has been ratified, and election campaigns for a permanent government are underway, Chalabi has suddenly become friendly with the United States again. But he also has learned a lesson about Washington politics. After the Washington schedule was announced, he cleverly first paid an unannounced visit to Iran and held talks with newly elected President Mahmoud Ahmadinejad on Nov. 5. No mean politician, Chalabi clearly knows how to play enemies against each other. By talking with Ahmadinejad, he will guarantee that he will receive serious attention in Washington. Besides, Chalabi still has friends in Washington. His Washington talks include a meeting with Secretary of State Condoleezza Rice on Nov. 9. Bush administration adviser Richard Pearle has supported him loyally throughout his exile from Washington's favor. He is still supported by historian Bernard Lewis. This week he will address the neoconservatives in their bastion of power, the American Enterprise Institute. A look at his election campaign explains his appeal to Washington. His call for a "national unity government" pulls out all the stops. He appears in public flanked by two women also running on his ticket, but appearing in traditional all-encompassing chadors covering everything but their faces. His coalition consists of his own National Iraqi Congress, along with Kurdish and Turkomen groups. He publicly affirms his loyalty to Ayatollah al-Sistani, but he also includes a group that favors restoration of the Iraqi Hashemite monarchy, most likely in the person of Crown Prince Hassan of Jordan. A constitutional monarchy for Iraq would require another modification of the constitution, but it is a course favored by Bernard Lewis and former CIA Director James Woolsey, and many others in Washington, because it would cement an alliance between Iraq and Jordan, and draw Iraq out of the sphere of Iran. At this juncture, it seems that Chalabi miraculously has no serious rivals for power. One other ticket headed by former U.S. appointed Prime Minister Ayad Allawi (a relative by marriage of Chalabi) is not likely to garner many votes. Other major tickets consist of a Kurdish party and a coalition of three Sunni Arab parties. Chances are good that Chalabi's ticket will win a roaring victory - and voila! He will be prime minister. Editor's note: PNS contributor William O. Beeman is professor of Middle East Anthropology at Brown University. He has lived and worked in the Middle East for more than 30 years. His forthcoming book is "Iraq: State in Search of a Nation." Editor's Note: Never mind that former Iraqi exile Ahmad Chalabi was convicted of embezzlement and mislead the U.S. about weapons of mass destruction in Iraq. The savvy politician has remade himself, still has significant support in Washington and may become Iraq's prime minister. Like a bad penny, Ahmad Chalabi is again turning up, and miraculously the United States is set to back him as prime minister of Iraq in the upcoming Dec. 15 elections for the first "real" government in the country. His visit to Washington is scheduled for November 7-12. Chalabi's family has a pedigree that goes back to the founding of the Iraqi state by the British in the 1920s. The Chalabi's were the only Shia family to be represented in government cabinets during the Iraqi monarchy, which ended in the 1958 revolution that ushered in the age of military dictatorship culminating with Saddam Hussein. He believes that he has a presumptive right to rule, and is willing to stop at nothing to achieve his ambitions. Now that the Iraqi constitution has been ratified, and election campaigns for a permanent government are underway, Chalabi has suddenly become friendly with the United States again. But he has also learned a lesson about Washington politics. After the Washington schedule was announced, he cleverly first paid an unannounced visit to Iran and held talks with newly elected President Mahmoud Ahmadinejad on Nov. 5. No mean politician, Chalabi clearly knows how to play enemies against each other. By talking with Ahmadinejad, he will guarantee that he will receive serious attention in Washington. Bush administration advisor Richard Pearle has supported him loyally throughout his exile from Washington's favor. He is still supported by historian Bernard Lewis. This week he will address the neoconservatives in their bastion of power, the American Enterprise Institute. At this juncture, it seems that Chalabi miraculously has no serious rivals for power. One other ticket headed by former U.S. appointed Prime Minister Ayad Allawi (a relative by marriage of Chalabi) is not likely to garner many votes. Other major tickets consist of a Kurdish party and a coalition of three Sunni Arab parties. Chances are good that Chalabi's ticket will win a roaring victory -- and voila! He will be prime minister. Washington is not going to stay mad at Chalabi if he brings stability to Iraq. The conflict there is a festering canker on the George W. Bush presidency. To have even a crook, a liar and a cheat in office will be welcome if it rescues America from the Iraqi quagmire. PNS contributor William O. Beeman is professor of Middle East Anthropology at Brown University. He has lived and worked in the Middle East for more than 30 years. His forthcoming book is "Iraq: State in Search of a Nation."